Again, you can always contact us about a page that needs an edit by contacting us. Or you can update the page yourself! Some pages, like tournament scoreboards or picks and bans, might be a bit confusing to edit. If you're unsure what to do, let us know that you were interested in editing a page but couldn't figure out how to. We're in the process of creating several tutorials to help you out, so we'll try to add one for whatever it is that you couldn't figure out. Even if we could ask every single player individually what they want us to list, that still may not coincide 100% with what you "want" displayed by them. Yes, Huhi obviously "should" have Korea listed and not France, but who knows what the exception might be under this other system (which we couldn't implement anyway due to impracticability). Finally, country of birth. This is extremely easy to define, will never change, and is something that's generally easy to determine frequently without contacting the player directly since team announcements and other tournaments often list it themselves. It's not a perfect correlation with nationality, but it's pretty good, and as of May 2016 there's only one player whom people frequently complain about using COB for (Huhi). Why was Origen in the past abbreviated OR instead of OG? For technical reasons, we used to be unable to have two teams with the same short name, and we reserved OG for OpTic Gaming in case they ever entered League of Legends. However, we eventually began to use Origen's full name as its short name since 6 characters is short enough for a short tag, so this became irrelevant even prior to the team's disbanding. Why do you write KingZone instead of KING-ZONE? We tend to standardize capitalization for LCK teams; we also write Kongdoo Monster instead of KONGDOO MONSTER and SK Telecom T1 instead of SK telecom T1, despite the alternate stylings used for these teams on the official LoL Esports site. Why are your notability guidelines for support staff so strict? There's a lot of contributing factors. Historically, it has been very difficult to assess the impact support staff had on teams, and in many cases this trend continues. Even after head coaches became a formal part of LCS rosters, there were teams that didn't utilize this position and just had stand-in coaches. And outside of the coach role itself, it's still hard to judge the impact / relevance of other support staff positions. In some teams the support staff are as important as the players, but that's not the case everywhere. It's often harder to find data on roster changes related to support staff. Not all teams announce this. Player rosters can be discovered by watching teams play, not so for support staff. We are not losing data by not making these pages. We still track support staff changes to the fullest of our ability on team pages. If you wanted to research a particular coach or analyst's career, you could already do so by searching the wiki. Support staff don't have relevant stats to attach to their page the same way players do. There's no reason to have a location to keep match history or statistics pages on hand, because this information simply doesn't exist for support staff. The wiki is not a site for hosting resumes. While this question is frequently asked by support staff, it's extremely rare that I've been approached by fans looking for information about support staff that they're unable to find. This may be a failing of the community as a whole to recognize the importance of support staff, but we try to provide information that's useful to people. Our notability guidelines have to be absolute. Doing things on a case-by-case basis leads to unjustifiable inconsistencies. So committing to doing more support staff pages means committing to doing a lot more support staff pages. Everything we do has to be weighed by importance. We don't have an infinite number of editors with infinite time. So creating more pages about XYZ will always be at the cost of having pages about ABC. But why not just let support staff make their own pages? A few reasons. This would lead to inconsistencies in who has pages that would seem unfair/illogical to fans. Our pages have pretty strict quality standards. We obligate ourselves to keep player pages updated. What would we do if a member of a support staff started a great page but then abandoned it? If we delete it or move it to the user namespace, people might wonder where the page went. (And if no one wonders this, the page wasn't being used in the first place.) And if we continue to maintain it ourselves then we run into the problems discussed above. A lot of historical data can be hard to verify. It has happened that a person edits themselves into the history of a team, but when I contact the team we are told they did not actually hold the position they said they did. This issue would only be compounded if we had to verify an entire person's competitive history. If you want to make a page for yourself, you can still do that in the User namespace. Click here to get to a page that you can create. We do not officially monitor user namespace pages, and we don't link to them from elsewhere within the wiki, but as long as you don't misrepresent your user page as an official wiki page you can feel free to share it. We also don't guarantee technical support for user pages, but if you join our Discord you can ask in the channel #wiki-help and maybe someone can help. What's the difference between you and Esportspedia/EsportsWikis? 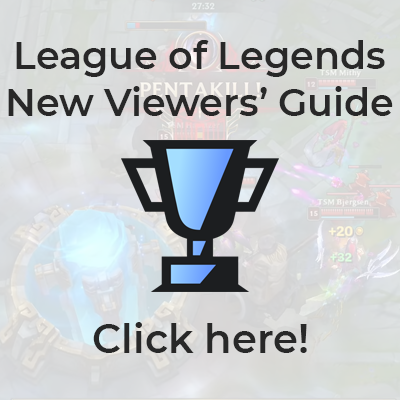 Our staff includes both the editing base of the old Leaguepedia wiki as well as that of Esportspedia/EsportsWikis - combined, we are able to cover a lot more events and bring overall a much better wiki! You can read more here. Where can I find the old Leaguepedia wiki? Your best bet to get a quick response is to join our Discord. However you can also tweet at us or contact a staff member directly. If you're not sure whom to contact but prefer not to use Discord, you can send River a message or email her at river(dot)esports(at)gmail(dot)com. This page was last edited on 14 April 2018, at 13:23.